← British Diaspora is a National Resource. The historically, hard-won right to vote in a democratic British society was not willingly conceded by the political class at the time, but equally can still be rather easily lost again through political calculation or neglect e.g. as in the case of the 15-year-limit on voting rights for British citizens overseas. 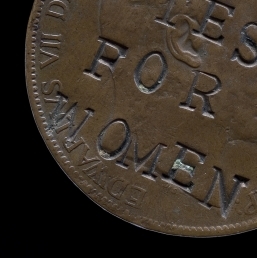 This suffragette-defaced penny (Object n° 95) is a powerful symbol of the lengths women had to go to, to change the law and secure the right to vote, including becoming systematic law-breakers and going far beyond civil disobedience. The image of King Edward VII has been defaced in what was then a criminal act by stamping “Votes for Women” over the king’s head. By the 1880s some 60% of the male population had the right to vote but no women. Not until 1918, with a powerful final impetus for their campaign from their successful support work in more traditionally male occupations during the First World War, were British women over the age of 30 given the right to vote. In 1928 the Equal Franchise Act extended the vote to all women over the age of 21, on the same terms as men. Following such an historic struggle to secure their voting rights, shouldn’t you make sure that you are still qualified to vote or not via the Electoral Commission’s website www.aboutmy vote.co.uk ? You can also show your support for our campaign to remove the 15-year-limit on our voting rights by adding your own vote here. Reference: “A History of the World in 100 Objects” pp 620 – 625: Neill MacGregor, Director of the British Museum. This entry was posted in +5 million British Expats Abroad, Anomaly of Voteless Expat Brits in EU, Democracy in Terminal Decline, Electoral Commission, Electoral Reform & Overseas Voter Reg., European Court of Human Rights, Hard-Won Right to Vote, Harry Shindler's Human Right to Vote, Lord Lexden Continues Challenge, Low Turnout - Not No Vote, Outdated Objections to Voters Overseas, Voting Rights, Younger Generation Voters. Bookmark the permalink.